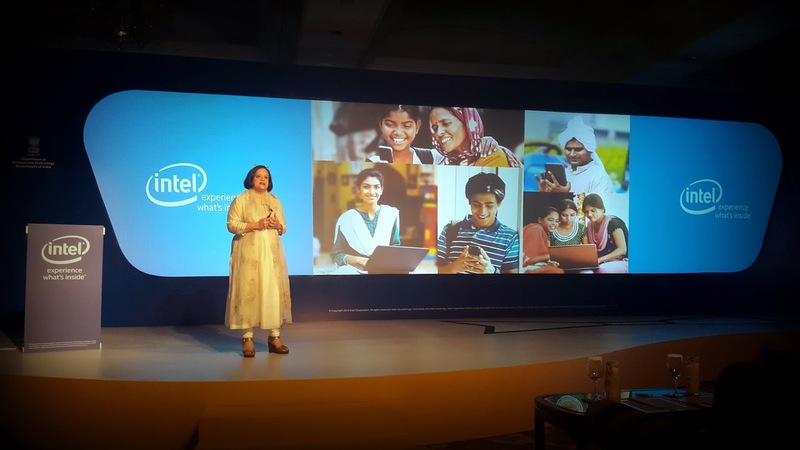 Launch of "Intel & DST Innovate for Digital India Challenge"
Somewhere in the middle of the week gone by, I received a special invite from one of my favorite companies, Intel, to attend a launch event. This was perhaps their way of saying "thank you" for my continued patronage in the Digital India campaign. The #Innovate4DigitalIndia challenge aims to foster technology innovation to help scale technology adoption in India. The guest list comprised of eminent names from both corporate as well as academia. The emcee, Eashwari Deshpande, welcomed the guests and then invited Debjani Ghosh on stage to deliver the introductory speech. Creativity is 'thinking' about new things. Innovation is about 'doing' new things. Intel is celebrating the 50th anniversary of Moore's Law. Gordon Moore co-founded Intel in 1965. Question to the audience: "How will you transform the world in the next 50 years?" Emphasized the power of exponential growth. According to Moore's Law, every two years, for the same price of processor, the computing performance doubles. IT is at the heart of Digital India. Imagine what 1.2 billion "educated" people in our country can achieve. And when that happens, it will be the biggest transformation the world has ever seen. Stop debating if Digital India will happen or not. It will. The question is: how are you contributing towards it? India needs grounds-up innovation. Examples: Micromax introduced dual SIM in smartphones and Flipkart introduced the Cash on Delivery mode of payment for eCommerce transactions on their site. Best innovations are in fact the simple ones. Make tech relevant, simple, and usable. 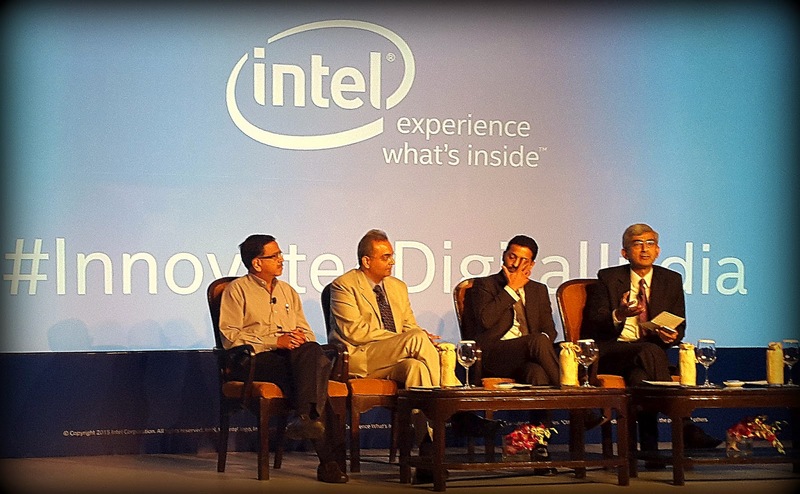 Narendra Bhandari, Director - Asia Pacific and Japan at Intel, then invited a distinguished panel of three on stage. The panel comprised of: Gaurav Dwivedi (CEO, MyGov.in), Prof. Rakesh Basant (Chairperson, CIIE at IIM), and Vikas Jain (Co-founder, Micromax Informatics). 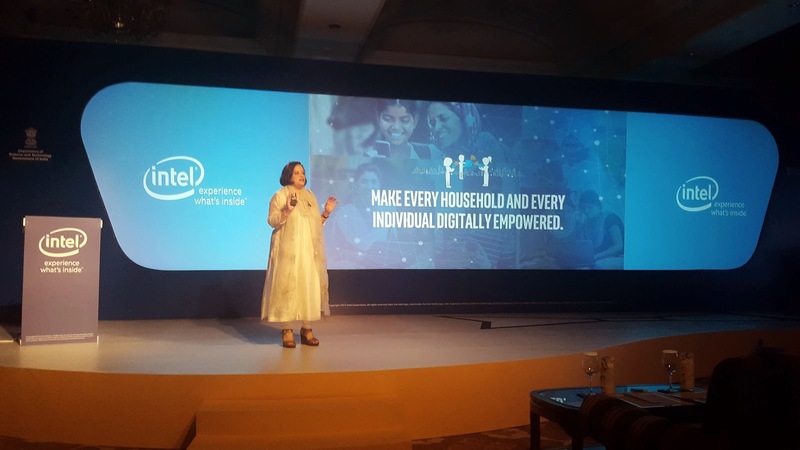 Intel and CIIE are partnering with MyGov.in for the 'Innovate for Digital India' challenge. Together, they will facilitate the program and popularize it through social media. The challenge runs from April 24, 2015 to January 2016 and is open to aspiring entrepreneurs, academia, and start-ups. It has four stages namely Application, Accelerator, Go-To-Market, and Pilot. The challenge will culminate with "Investments and Showcase" stage in January next year. Total grants - INR 1.5 crores (Top three winners will get access to seed fund of INR 20 lakhs each). 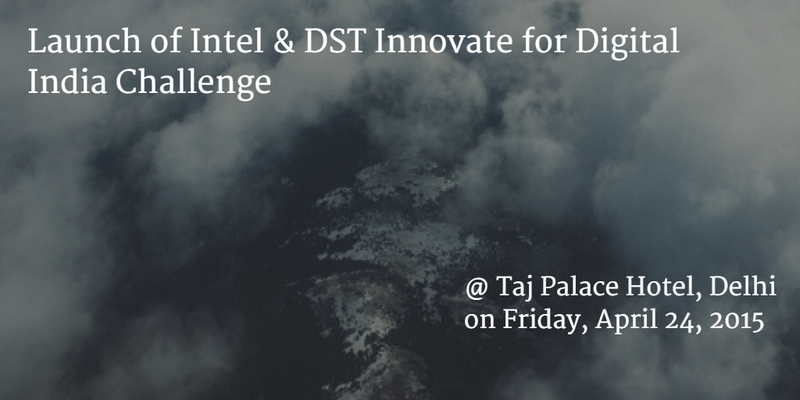 More details on the "Intel and DST Innovate for Digital India Challenge" are available at http://innovatefordigitalindia.intel.in/. MyGov.in started on July 26, 2014. Since its official launch, the site has garnered over 888.57k registered members, 120.8k submissions in 160 tasks, and 496.73k comments in 179 discussion themes. There are over 33 active groups, with the Swachh Bharat (Clean India) group being the most popular one. Plans to develop a PMO app; will crowd-source the development of this app. Merely having ideas is not enough; take these ideas toward execution. MyGov.in is not a talking shop but a solution provider. Every right thinking Indian should be on MyGov.in. 500 mentors across the country will look at ideas from different perspective. Academic interaction is part of the DNA in Western Europe or the US. Unfortunately, it does not exist in India. Compare any single largest Indian university to a small university in the US and you'll notice that we still have a long way to go. Distance is not going to die after digital; physical presence will still be required. The 'Innovate for Digital India' challenge should aim to solve social problems while focusing on idea incubation. Focus on innovation fueled by real-life requirements. Advice to entrepreneurs: best place to be right now is India. If you have an idea, there is a consumer who can be serviced. Incubators work with academicians and government, but the need of the hour is to work with corporate who understands business. Problems are the same, but you can change the answers. Finding new solutions is the key. Create something so disruptive that people would want to use it. Don't worry if you don't get right the first time (The makers of Angry Birds, the 2 Billion Download Game, hit the bull's eye at their 52nd attempt). Create vernacular content for apps. 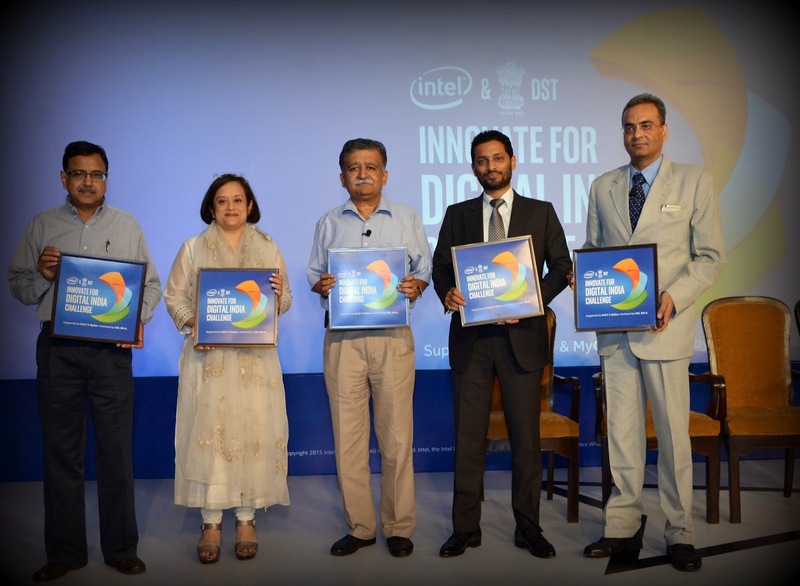 Finally, "Intel & DST Innovate for Digital India Challenge" was officially launched in the presence of media and other personnel. If you know someone with an earth-shattering idea, ask him to participate in the challenge and contribute towards the growth of Digital India.